It’s no secret that I’m a huge fan of Ronald Reagan. He’s definitely the greatest president of my lifetime and, with one possible rival, he was the greatest President of the 20th century. If his only accomplishment was ending malaise and restoring American prosperity thanks to lower tax rates and other pro-market reforms, he would be a great President. He also restored America’s national defenses and reoriented foreign policy, both of which led to the collapse of the Soviet Empire, a stupendous achievement that makes Reagan worthy of Mount Rushmore. But he also has another great achievement, one that doesn’t receive nearly the level of appreciation that it deserves. President Reagan demolished the economic cancer of inflation. Even Paul Krugman has acknowledged that reining in double-digit inflation was a major positive achievement. Because of his anti-Reagan bias, though, he wants to deny the Gipper any credit. Robert Samuelson, in a column for the Washington Post, corrects the historical record. Krugman recently wrote a column arguing that the decline of double-digit inflation in the 1980s was the decade’s big economic event, not the cuts in tax rates usually touted by conservatives. Actually, I agree with Krugman on this. But then he asserted that Ronald Reagan had almost nothing to do with it. That’s historically incorrect. 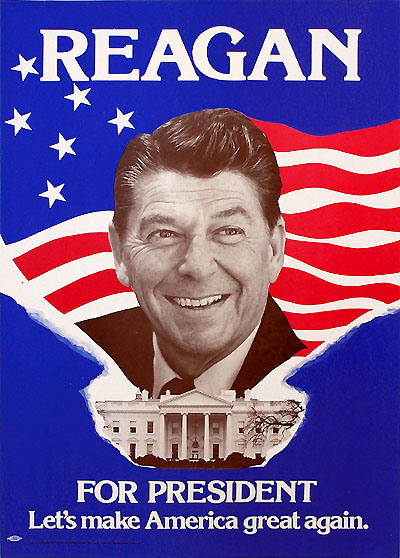 Reagan was crucial. …Krugman’s error is so glaring. Samuelson first provides the historical context. For those too young to remember, here’s background. From 1960 to 1980, inflation — the general rise of retail prices — marched relentlessly upward. It went from 1.4 percent in 1960 to 5.9 percent in 1969 to 13.3 percent in 1979. The higher it rose, the more unpopular it became. …Worse, government seemed powerless to defeat it. Presidents deployed complex wage and price controls and guidelines. They didn’t work. The Federal Reserve — custodian of credit policies — veered between easy money and tight money, striving both to subdue inflation and to maintain “full employment” (taken as a 4 percent to 5 percent unemployment rate). It achieved neither. From the late 1960s to the early 1980s, there were four recessions. Inflation became a monster, destabilizing the economy. The column then explains that there was a dramatic turnaround in the early 1980s, as Fed Chairman Paul Volcker adopted a tight-money policy and inflation was squeezed out of the system much faster than almost anybody thought was possible. But Krugman wants his readers to think that Reagan played no role in this dramatic and positive development. Samuelson says this is nonsense. Vanquishing inflation would have been impossible without Reagan’s involvement. What Reagan provided was political protection. The Fed’s previous failures to stifle inflation reflected its unwillingness to maintain tight-money policies long enough… Successive presidents preferred a different approach: the wage-price policies built on the pleasing (but unrealistic) premise that these could quell inflation without jeopardizing full employment. Reagan rejected this futile path. As the gruesome social costs of Volcker’s policies mounted — the monthly unemployment rate would ultimately rise to a post-World War II high of 10.8 percent — Reagan’s approval ratings plunged. In May 1981, they were at 68 percent; by January 1983, 35 percent. Still, he supported the Fed. …It’s doubtful that any other plausible presidential candidate, Republican or Democrat, would have been so forbearing. Here’s what Samuelson wrote in a follow-up column debunking Krugman. As preached and practiced since the 1960s, Keynesian economics promised to stabilize the economy at levels of low inflation and high employment. By the early 1980s, this vision was in tatters, and many economists were fatalistic about controlling high inflation. Maybe it could be contained. It couldn’t be eliminated, because the social costs (high unemployment, lost output) would be too great. …This was a clever rationale for tolerating high inflation, and the Volcker-Reagan monetary onslaught demolished it. High inflation was not an intrinsic condition of wealthy democracies. It was the product of bad economic policies. This was the 1980s’ true lesson, not the contrived triumph of Keynesianism. If anything, Samuelson is being too kind. One of the key tenets of Keynesian economics is that there’s a tradeoff between inflation and unemployment (the so-called Phillips Curve). Yet in the 1970s we had rising inflation and rising unemployment. While in the 1980s, we had falling inflation and falling unemployment. P.S. Since today’s topic is Reagan, it’s a good opportunity to share my favorite poll of the past five years. P.P.S. Here are some great videos of Reagan in action. And here’s one more if you need another Reagan fix. P.P.P.S. And let’s close with some mildly risqué Reagan humor that was sent to me by a former member of Congress. If you want more Reagan humor, click here, here, and here. He loved our country! Unlike the current one I the WH! You are correct about Cater. Unfortunately for Carter it was not his natural inclination and so he came to it late and is not given credit for it. And of course there was Reagan’s shredding of the 4th. Despicable. And the move was purely political. In addition he shut down all research into cannabis and cancer. Can’t give the hippies any ammunition dontcha know. Cancer kills one person a minute. So Reagan is right up there with Stalin and Hitler – indirectly of course. In 50 years that one move alone will overshadow everything else he did. 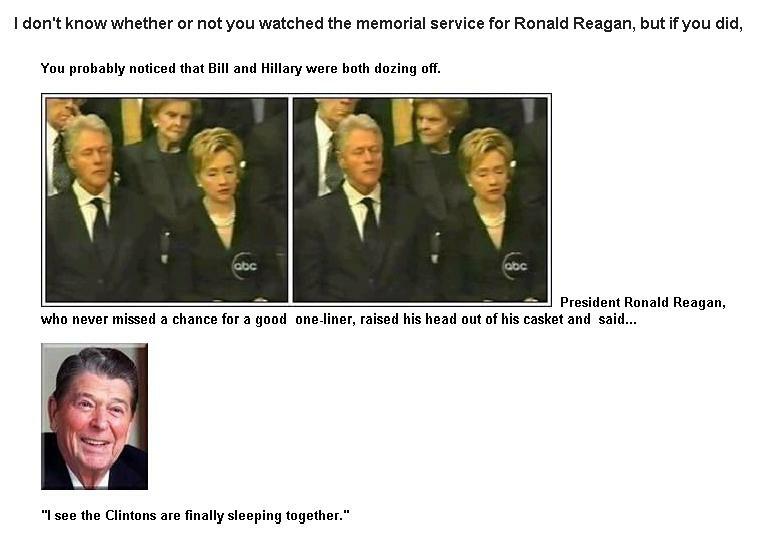 The remembrance will be – Reagan the mass murderer. Do you feel like Jimmy Carter has been unfairly blamed for the “malaise” at all? The stagflation that characterized his only term was (I would argue) a remnant of the LBJ and Nixon administrations, more than anything. LBJ with his “great society” and Nixon with his wage and price controls, not to mention their exorbitant spending on the war in Vietnam. Jimmy Carter abolished Nixon’s wage and price controls, deregulated sectors of the gas industry, and appointed Paul Volcker to the Federal Reserve. I feel like Carter should receive some credit for the economic boom of the eighties along with Reagan. Reagan’s most unappreciated triumph (Nixon helped) was installing judges on the Supreme Court who would gut the 4th Amendment without obvious prompting. Of course it was what he and Meese wanted. So in a sense it was intentional. We are now all suspects and subject to general warrants – road side safety checks and the like. And don’t forget middle of the night no knock raids. When I was growing up that was the function of Nazis in war propaganda movies. It is still the function of Nazis. Only now they are American.